Getting there: A quarter mile east of I-75 at the Lewiston/Frederic exit (Exit 264). 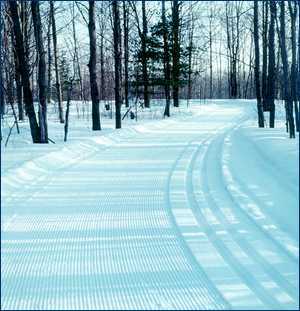 What's there: Enjoy miles of rolling, wooded trails that are carefully designed for all levels of ability and immaculately groomed by the largest fleet of Nordic only grooming equipment in the Midwest. Combine that with the local Frederic micro-climate of early and frequent snowfalls, and it all adds up to FUN!!! 20 K groomed skating & classic. A wide variety of terrain. Forbush tends to get snow early and late and is usually the first place to open for the season (often before Thanksgiving!) and one of the last to close at the end of the season.